"While there may be alternatives to Catholic Education, there are no substitutes." St. Timothy Catholic School will unite with families to extend the mission of our parish to "Stir into Flame the Gift of God" (2 Timothy 1:6). The school compliments the Worship, Community, Outreach and Faith Formation ministries of our parish. We accommodate children of varied learning styles and economic backgrounds and strive for the excellence of each student's academic, social, emotional and physical growth deeply rooted in our Catholic Faith. Especially through Service Learning, our students will become active and responsible citizens who embrace the teaching and Gospel message of Jesus Christ and His Church put into practice. As a Catholic School, St. Timothy will encourage all of our families to attend Mass together and be actively involved in the parish , school and multiple Service Learning Opportunities. 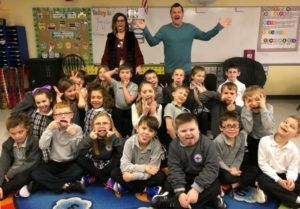 Mrs. Roberts invited Tim with Q102 to have snack with her 2nd graders at St. Timothy Catholic School in Union, KY. The kids LOVED Snack Time with Tim and LOVED to chat! He asked them who is the best driver in their house? Our Faith is integrated into our lives and we live and teach our Faith in all that we do! The students will attend Mass once a week and participate in Adoration and Benediction once a month, which will put their Faith in action through prayer, song, and intention. With the use of our Catholic curriculum, students will learn the fundamentals of our Faith and how to bring their own Faith to life. Our students contribute to our community through service learning projects; making a difference in the lives of others. Our students will connect with one another through Faith Buddies, Olympic Day and monthly assemblies where they work together in multi-modal activities. Our students will learn to be confident by using the gifts that God gave them to be themselves and help others. All this is part of our Faith – The Faith we learn, live and love.